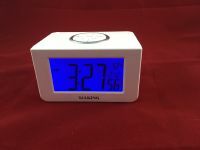 Clock has special, long-lasting, 5-minute alarm. Heavy-duty, with special weekend alarm. Features crystal-clear female voice and 1" high numbers on a huge, brightly-lit digital LCD display. Stands 4-1/2" tall, with rubber feet on the bottom. Indoor temperature is available in Fahrenheit or Celsius. Measures about 5 in by 5 in by 4 in. What's more, a blind person can easily set the time and alarms - each Mode button beautifully speaks exactly what it's doing. (Our favorite thing about setting the time on this clock is that there are both Forward and Backward buttons, so if you go one minute past the top of the hour, you don't have to press a button fifty-nine times to move one minute back.) The only thing you'll need a sighted person to set on this clock is the date - if you plan on using the weekend alarm. Of all our talking products under twenty dollars, this one wins first prize for its crystal-clear speech, which is great for those with hearing loss. As well, the one-inch high numbers on the huge, brightly-lit LCD display will score major points with individuals who are visually impaired. Standing a full four and a half inches tall, our heavy-duty Talking Thermometer Clock has rubber feet on the bottom to prevent it from sliding around. Built to last for years and years, this sturdy clock will look simply stunning on your nightstand, desk or coffee table! Uses four AA batteries (not included). Directions for the Talking Thermometer Clock From Future Aids, The Braille Superstore. Insert batteries into your new Thermometer Clock by sliding off the battery door, located on the bottom of the unit. 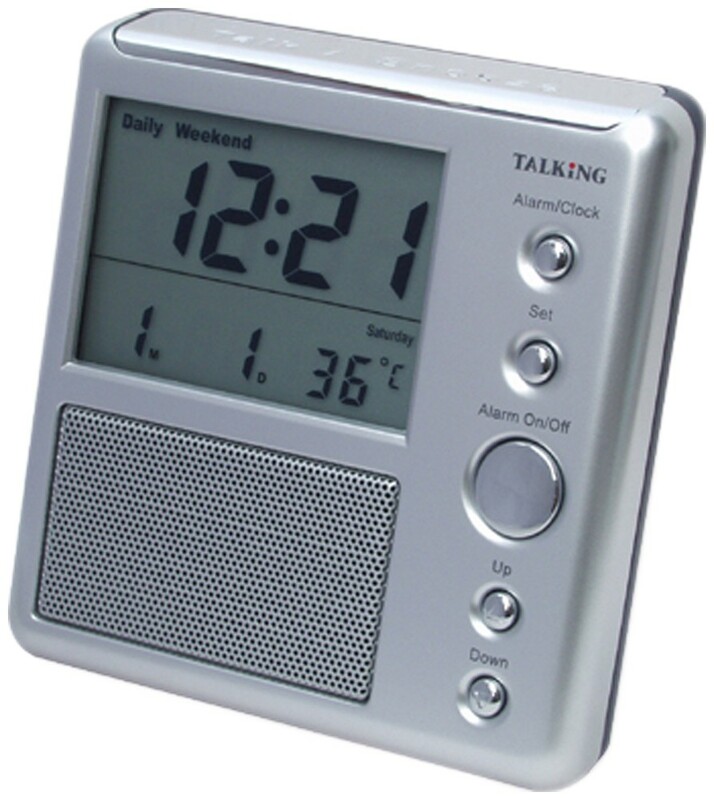 This done, place your new thermometer on a desk in front of you, with the speaker and display facing you. Buttons. There is a large button on the top of the unit. This is the talk button. There are five buttons on the front, on the right. In order from top to bottom, they are Mode, Set, Alarm, Up, and Down. There are two switches on the back of the unit, just behind the talk button. The left one selects whether you want the temperature spoken in Celcius or Fahrenheit. The right one is a volume switch. Normal Opperation. Press Talk to hear the current time and temperature. Press Alarm to turn daily and weekend alarms on and off. Setting the time. Press Mode once to enter the "Daily Alarm" set function. Press set to select Hour in the set mode. Press Up and Down to change the hour to the one you want. Press Set to change to Minute, and again use Up and Down to set the minute. Press Mode to the "Weekend Alarm," and repeat the procedure. Finally, press Mode again to set the unit's time, and follow the above instructions. Press Mode one more time to return to normal mode.